Editor’s Note: The following is the text of founding NPI boardmember Gael Tarleton’s message to the Federal Communications Commission urging the Republican-controlled body not to scrap the rules that protect Internet freedom in the United States — a move NPI strongly opposes. 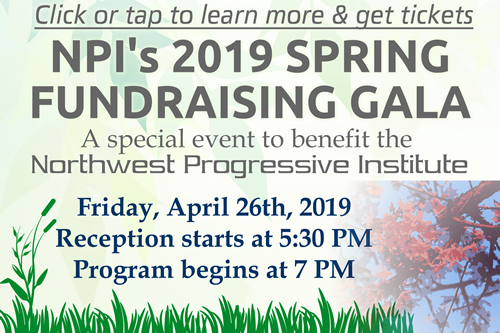 Gael has served on NPI’s Board of Directors since its inception in 2010; she represents Washington’s 36th Legislative District in the State House of Representatives. Protect Net Neutrality. Every public official has a clear-cut responsibility to the public mission of a public agency. This decision you are about to make is that clear-cut: protect net neutrality to serve the public good. During the course of my professional career, I have had the rare opportunity to analyze the U.S. communications infrastructure that was vulnerable to Soviet strategic nuclear attacks. Then I had the opportunity to work for a large company that bought Network Solutions, which was the small company that worked for the U.S. government to create domain names for the internet. I learned about net neutrality from the civil servants who created the Internet with funding from the Defense Advanced Research Projects Agency. They built the iIternet to support universities, national laboratories, and defense agencies conducting research and development with federal funding. In the private sector, I led research teams in the United States, Russia, Ukraine and Europe, using the Internet to implement critical U.S. government research programs. At one of the nation’s top public research universities, I worked with faculty and students whose educational and research projects required online studies, international research exchange programs, and coordination with research partners throughout the U.S. federal government. All of these educational and research endeavors depended on equal access to the internet regardless of time zone differences or days of the week. I was an elected Commissioner of the largest airport and seaport in the Pacific Northwest, and know that global trade, commerce, and tourism are impossible without ubiquitous access to the internet. There is not a single business or security operation in America – not an airport, rail system, trucking operation, or shipping enterprise – that will function without 24/7 access to the Internet to conduct financial transactions and transmit vital security information globally or locally. Now I am a State Representative in Washington State. I am the Vice Chair of the Technology and Economic Development Committee and a member of the Higher Education and Transportation Committees. Equal access to the internet is the single most important factor determining whether entrepreneurs, students, corporate behemoths, and small businesses can function in a modern, global economy. Without equal access to the internet, there is no equality. When internet access is disrupted, local and global economies, supply chains, and educational institutions are crippled. Equal access to the internet is an imperative. You are public servants. Your responsibility is to protect the investments that the U.S. taxpayers have made in building and maintaining critical public communications infrastructure. You are appointed to a position of extraordinary responsibility. The truth is this: you are accountable to the people you serve, and the people you serve are the American people. All future generations will be affected by the decisions you make during your terms of office. The Internet is not a convenience. It is not something for sale. It is not owned by private corporations and it is not something given out as rewards. The Internet is the 21st century’s equivalent of electricity or clean water. It is an essential public good for every individual, community, state, and nation. As public servants, your mission is to protect the public resources entrusted to your care. The internet was created with public money. The Internet was designed to serve the public good. Nothing in the FCC’s charter gives your agency the authority to unravel the Internet and decide who gets access when. Protect net neutrality. Do the right thing. WANT TO SEND YOUR OWN MESSAGE TO THE FCC? The Democratic commissioners (Mignon Clyburn and Jessica Rosenworcel) are on record in opposition to the plan to gut net neutrality, but you can email them too. Thanks for fighting the good fight, NPI!